April 23, 1984 was a sad day for our family. 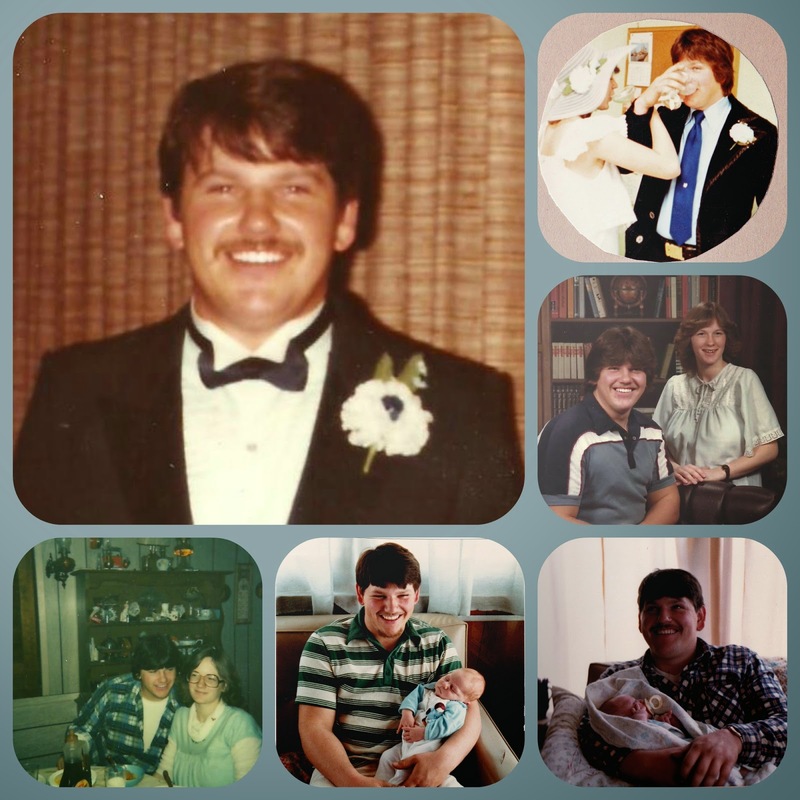 It was 31 years ago today when my sister's husband, Carl, was killed in a truck-train collision shortly after their 2nd child was born. I was 14 years old, and I remember the various emotions I felt - shock, disbelief, anger, grief, and incredible sadness, especially for my sister, Judy. But, on this anniversary of Carl's death, I don't want to focus on the pain we all endured. Instead, I want to focus on the good memories we have of Carl - the things that make us smile. This post is especially for you, Judy. We all loved Carl, and we all love YOU. FROM DAD: He was a dedicated man to the Word of God. He loved Jesus. He told me so. FROM MOM: He was soft (like my dad). Never spoke mean. He was a tender man. He loved Jesus. He had a gentle spirit yet was a hard tough worker. He cared about others and showed it. FROM DANIEL: Having no brothers while growing up, I was excited to have a brother (-in-law). Carl spent time with me playing games (i.e. Checkers) and talking. I always enjoyed his company and fellowship. I also remember how Carl had a giving heart and wanted to share with others. When I had my first vehicle, I wanted a passenger side rear view mirror. He took me to a box in a garage and said I could have any mirror in the box. I found a set that fit my model and attached them. It was exciting to see the rear view from both sides of the car, and each time I looked through the mirrors, I was reminded of my brother (-in-law) and his love for me and our family. FROM ME: When I was 11 years old, I became a sister-in-law for the first time. I was so excited for my sister to get married. Carl was a handsome, young man who was quiet and kind. He had a tender heart and a good sense of humor. I don't remember any specific words he said, but I do remember some actions. I remember how he liked macaroni pasta with plain tomato sauce on it. I remember him teasing me like a big brother would. I remember him helping my dad do some work in Grandma's yard. I knew, by his actions, that he loved my sister, he loved his two children, and he loved our entire family. FROM AMANDA (A newly born baby when Carl died): I don't know much. I do know that he didn't like cigarettes and he was really big and strong. FROM RYAN (2 years old when Carl died): One story I remember Mom telling me is how Carl lifted and held the car so mom could change the tire. One of my cousins told me he could lift out an engine with his hands and put in a new one and make it look easy. I always wanted to be strong like that. I do have a memory of him around Easter - he was teasing me. There were two big peeps bunnies - one yellow one pink. I wanted the pink one and he said that one was his or moms or something like that. That memory has faded a lot. I also kinda remember sleeping on him, also running around in my diaper and the ground was all soggy. We were at the trailer and he was doing something with a black plastic hose. Another was him using a big orange chainsaw and I remember my uncles all standing around talking. These short memories are kind of like really short visions or movie clips. Wish I could remember more but I'm thankful for what I can remember. FROM JULIE M. (Family friend): Carl was a handsome young man, crazy in love with Judy. I will always remember his eyes that had the sparkle in them, his dimples, and his lovely smile that would fill your heart with love every time he smiled at you. I will never forget the day of his accident..... probably one of the hardest things I have ever done in my life, to go console Judy and their babies, Ryan and Amanda. Love Judy with all my heart. Thankful she found love again with Darren. As you can see, Carl was a blessing to our family and we thank God for the time we had with him here on this earth. We are thankful for the good memories we have of this good man, and we look forward to seeing him again someday when we reach our home in Heaven. every time I remember you. Encouragement Challenge #14: Happy Easter!